Samsung Electronics today announces that the European edition of its highly acclaimed Family Hub refrigerator will be unveiled at IFA 2016 in Berlin. The new 2-door refrigerator places the fridge on top and the freezer at the bottom, a configuration preferred by European consumers. Like the original Family Hub, the European Edition features Samsung’s exclusive Twin Cooling PlusTM technology, which cools the fridge and freezer separately with two different evaporators and keeps the temperature and humidity at optimal levels for foods. Family Hub also boasts Precise Chef CoolingTM, which holds temperatures to smaller fluctuations of just ±0.5 degrees. Together, Twin Cooling PlusTM and Precise Chef CoolingTM help users maximize food freshness at constant, optimal temperatures without mixing odours between the fridge and freezer. Three inner-view cameras take photos of refrigerator contents each time the doors close. Users can easily see what they have at any time and from anywhere with their smartphone. Family Hub owners can also keep track of expiration dates by entering the number of days their food has left. The number automatically counts down, details that can be checked on the touchscreen without even opening the door through the Food Reminder app. Consumers can also conveniently shop for groceries from the comfort of their kitchen counter via Online Shopping. Samsung has partnered with various online grocery shopping services from all regions such as Eataly, Supermercato24, and coop@home in Europe. Owners of the Family Hub will also be able to access exclusive recipes created by members of Samsung’s Club des Chefs, as well as thousands of recipes from global partners such as allrecipes, the most downloaded recipe app in the world, Whisk and CHEFKOCH.DE. Attached to the European Family Hub’s fridge door is a 21.5-inch touchscreen that can function as the family’s interactive White Board. Through the Samsung Smart Home app, family members can share photos and memos in real time from wherever they are. Users can also synchronize their smartphone calendars and share each other’s schedules with their family through the Sticki app. 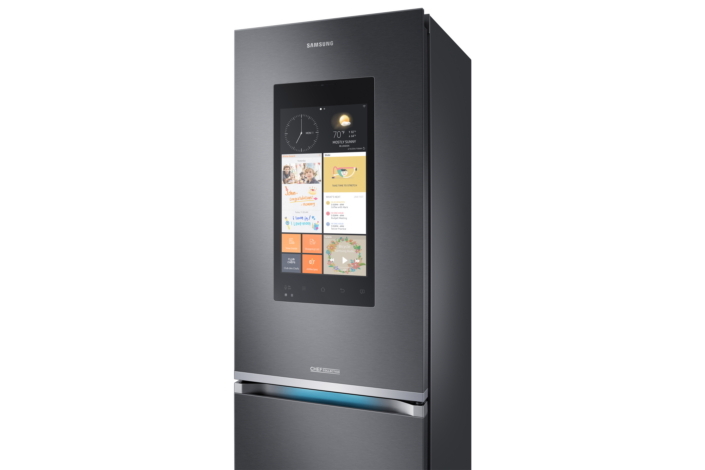 With the kitchen serving as the center of the home and a common gathering spot, the Samsung Family Hub Refrigerator is perfectly suited to entertain friends and family. It offers options for TV Mirroring and music streaming to play through its built-in speaker. The Family Hub is at the core of Samsung’s efforts to redefine kitchen experiences. In addition to its role in food preparation and storage, the Family Hub also acts as a hub for family communications, entertainment, and smart home services. With these functions, Family Hub transforms the kitchen into an ideal space for family time. Samsung Electronics’ booth will be open at Level 2 of City Cube Berlin from September 2 through 7 for IFA 2016.